What the heck?!? 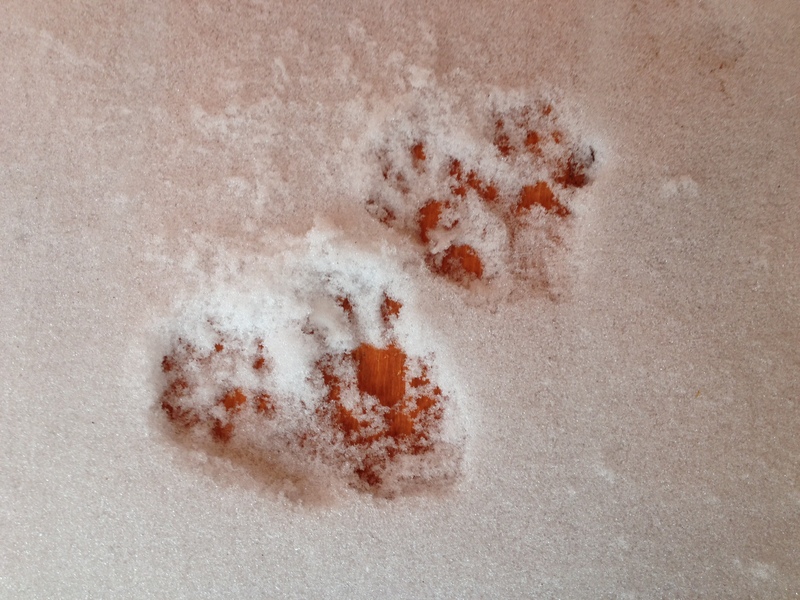 Who left these paw prints in the run? As Snowmageddon descends upon Detroit, Matt and I decided to carve out a run for our dog Charlie in the back yard. 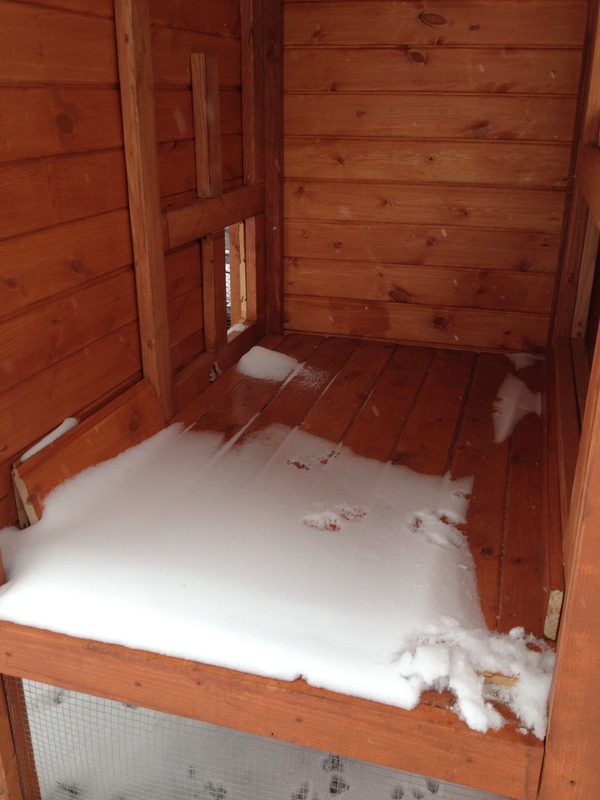 While I was doing some maintenance shoveling, I stopped to admire the chicken coop. 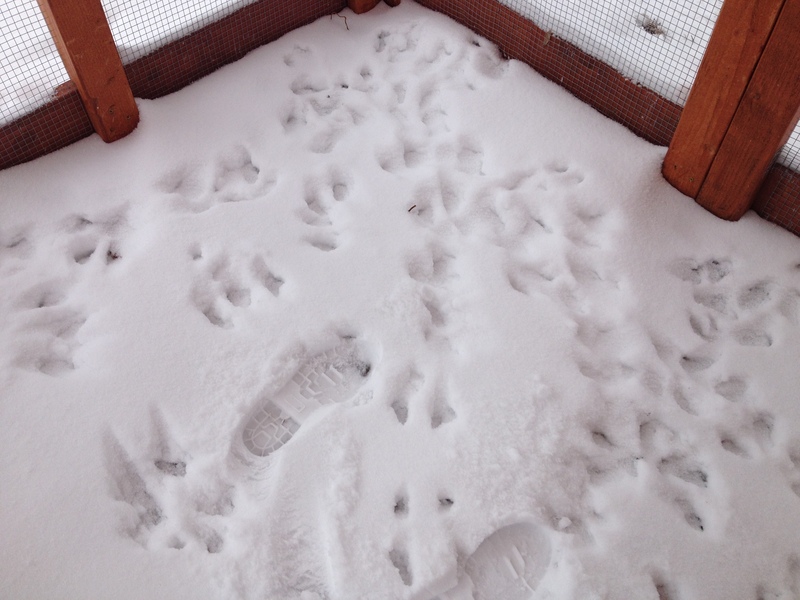 As I stepped closer, I noticed a bunch of paw prints inside the coop. Instantly I was alarmed. I walked inside the run to get a better look. The paw prints were everywhere. I wondered if a cat or raccoon was trapped inside. Cautiously, I peeked under the hen house and looked at the ceiling, half expecting a possum to drop on my head. The mystery critter gained access to the chicken coop run by easily hopping into the open hen house then jumping through the chicken door (seen to the back left). This situation demanded serious study. I pulled out my iPhone and dutifully took photos. Placing my hands on my hips, I twirled my head around and wondered what happened. The unfinished opening into the hen house. Of course! We still need to finish the outside door leading into the hen house, along with the guillotine door for the chickens that allows then access into the run. When I stepped outside and looked into the open hen house, I found evidence of how the mystery critter gained access to the coop. The good news is that after months of toiling and debating the best way to build this final door, Matt came up with a genius design. We will build it next weekend. Funny enough, after all the worry we invested into the hen house door, it will probably only take us a couple hours to construct. So we are in the final stretch of our general build, which will allow us to get an inspection. We will have lot of little things to do, but they are simple projects that can be done in the snow or much later in the summer months. In the meantime, the coop looks majestic covered in snow. It’s exciting to think that just in a couple months we’ll have peeping additions in our home. A close look at the evidence. Bunny prints?